During this practical based guide, we will highlight the main problem areas of the deadlift technique. We will then look at a training framework that will help you to overcome deadlift technique problems by incorporating partial movement training to improve your deadlift . First and foremost, what’s wrong with your deadlift technique and what variations can you use to assist with this? Problem 1: I’m strong off the floor, but weak at lockout. Usually when someone has this problem with their deadlift it's because they lift with what might be described as a rainbow back. The reason it feels so strong off the floor is because the rounding in your back reduces the lever arm between you and the bar. This makes the bar much easier to lift off the floor. 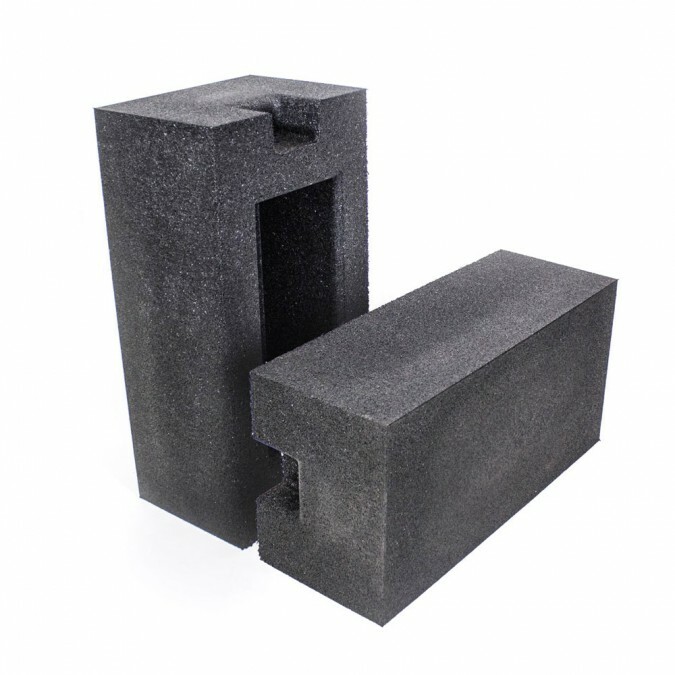 However, things go pear shaped when you get to lock out and can’t utilise your glutes because they are trying to extend a flexed spine that is being locked in place with several hundred kilograms. This puts you in between a rock and a hard place, the result of which, is a long and painful extension of your lumbar spine, you hitching the barbell, or not being able to lock out. What you need to achieve is a better and stronger starting position. The best way to achieve this is to lift lighter weights with a correct technique. However, there are a few deadlift variations you can utilise to help you get a better and more solid starting position. Pause deadlift at mid shin. Problem 2: My deadlift from the floor is slow, but when I get the bar moving it is pretty easy to lock out as long as I can get it to around knee level then all is well. For you, your technique is solid from the floor so it takes longer to overcome the bar’s inertia. This means it takes longer for the bar to come off the floor. The better your integrity is form wise from the floor, typically the more difficult it is to break the bar free; this is a good problem to have. It means you are lifting with safe but perhaps inefficient technique. This could mean you might need to adjust where you set your hips, or how you position your shoulders in the pull. This sort of adjustment is easy to make however, also extremely individual based on how you are built. Combo deadlift (deadlift to knee and pause + full deadlift). Problem 3: I never really get to use a weight that I feel like I'm failing with because my grip always feels like it is going to give out. For this person it is normally because they have never been introduced to the mixed grip, hook grip or lifting straps. This is basically the first problem most people come across when it comes to deadlifting as a novice. 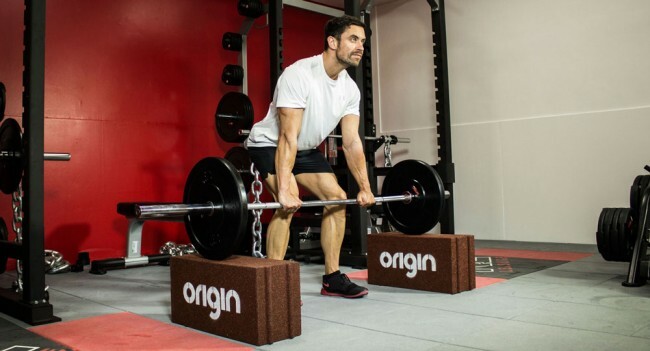 Grip gets a lot of attention when it comes to strength training and especially when it comes to deadlifting, this attention is warranted for some lifters but for some others once they learn how to do the mixed grip they never find grip to be an issue again. Double overhand deadlift. A good tactic is to do all of your warm ups double overhand until the weight becomes too heavy and you have to swap to another grip. This is a neat solution as it allows you to get some grip training at the same time as warming up which, you would have been doing anyway. High pick up deadlift holds. Starting with the bar on a rack or blocks load on around 80-140% of your deadlift max and just pick it up and hold it for time. This can be done with an overhand grip or your “competition” grip. Problem 4: I can’t recover from deadlift quickly when I pull I'm always stiff for 3-4 days. Is it because it is stressing my central nervous system? 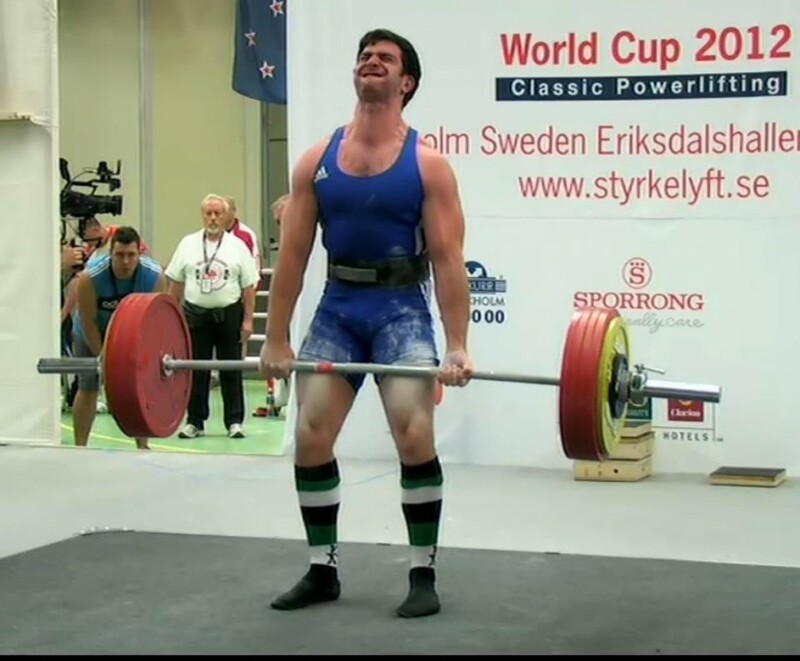 No, it is because you are not lifting to a programme that is targeted appropriately for your strength level, or you are lifting with poor technique. Ideally when training deadlift your lower back and trunk should act isometrically (stay the same length/stay the same shape) and act as a lever that your hamstrings and glutes can utilise around the hip. 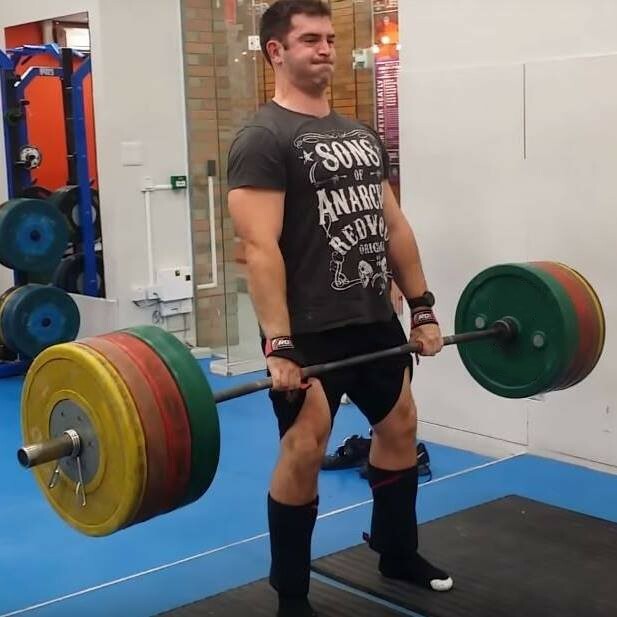 For people who feel that they get heavily fatigued from deadlift, it is because they are utilising loads where they don’t have the postural strength to maintain a good position, or they are not paying attention to their position during the lift, and simply ripping it from the floor. If you are pulling in a competition or want to pull to maximum, then your form will break down as ultimately for most people it is the stronger way of deadlifting. This however, is not a standard you should be following in your training week-to-week, as it will lead you to overloading muscles and tissues that shouldn’t be overloaded week-to-week. That is why you are stiff, your central nervous system has nothing to do with it. Outside of switching your programme for something that allows you a bit of breathing space to figure out your technique, here are some drills you can use to help with positioning. Deficit deadlift - you need to be careful when applying this, so keep it pretty light to start. The deeper position can force some lifters into figuring out how to get set and take advantage of their legs from the floor. Once you have identified what is wrong with your deadlift technique, try to incorporate some partial deadlift exercises into your training programme. Adding these partial movement exercises is a positive step in solving your deadlift problem areas and will help you improve your deadlift. How Many Times a Week Should You Deadlift? Typical bro-science wisdom is that you can only deadlift once a week or even as little as once every 2 weeks. We already touched on why this might not actually be the case in problem 4. Whilst I wouldn’t advise that you deadlift more than two times per week without the help of a coach, or someone who knows what they are doing; you can easily adopt a two times per week structure. You will then be able to begin to implement one of the partial movement deadlift variations to help improve your deadlift. Now that you know how to find your weaknesses in your deadlift technique, let's look at how you can incorporate partial movement dealifts and deadlift variations into your programme to improve your deadlift. Deadlift Variation: 2 sets of 5 at 50% one-rep max, 2 sets of 4 at 60% one-rep max, 2 sets of 3 at 70% one-rep max. Deadlift: 4 sets of 4 at 60% one-rep max. Deadlift: 1 set of 4 at 60% one-rep max, 2 sets of 3 at 70% one-rep max and 3 sets of 2 at 80% one-rep max. Deadlift Variation: 4 sets of 4 at 60% one-rep max. Deadlift Variation: 2 sets of 4 at 55% one-rep max, 2 sets of 3 at 65% one-rep max, 2 sets of 3 at 75% one-rep max. Deadlift: 4 sets of 4 @ 70% one-rep max. Deadlift: 1 set of 4 at 65% one-rep max, 2 sets of 3 at 75% one-rep max, 3 sets of 2 at 85% one-rep max. Deadlift Variation: 4 sets of 4 at 70% one-rep max. Deadlift Variation: 2 sets of 3 at 65% one-rep max, 2 sets of 2 at 75% one-rep max, 2 sets of 2 at 85% one-rep max. Deadlift: 3 sets of 3 at 75% one-rep max. Deadlift: Build up to 1 to 3 reps of one-rep max. Squat: 5 sets of 5 at 75% one-rep max. Deadlift Variation 2: 4 sets of 4 @ 60% one-rep max. Deadlift - 5 sets of 5 at 60% one-rep max. Deadlift Variation: 4 sets of 3 at 80% one-rep max. Squat: 5 sets of 2 at 85% one-rep max. Deadlift Variation 2: 4 sets of 3 at 70% one-rep max. Deadlift: 5 sets of 3 at 70% one-rep max. Deadlift Variation: 4 sets of 4 at 75% one-rep max. Squat: 5 sets of 5 at 80% one-rep max. Deadlift Variation 2: 4 sets of 4 at 65% one-rep max. Deadlift: 5 sets of 5 at 65% one-rep max. Deadlift Variation: 3 sets of 2 at 85% one-rep max. Deadlift Variation 2: 3 sets of 3 at 75% one-rep max. Deadlift: Build up to heavy set of 1-3 over 5 sets if you're feeling good then go for a personal best. Deadlift Variation: 4 sets of 6 at 50% one-rep max. Squat: 4 sets of 6 at 60% one-rep max. Deadlift: 3 sets of 6 at 70% one-rep max. We hope this guide helps you to improve your deadlift. At the very least it will give you some ideas on how to tackle your deadlift problems, implement different deadlift variations and incorporate partial movement exercises into your training programme. This entry was posted in Knowledge & Advice, How-to Guides, Training Guides on 18th May, 2016 by Marc Keys.